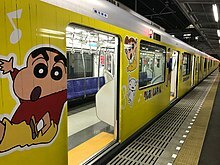 Crayon Shin-chan (Japanese: クレヨンしんちゃん, Kureyon Shin-chan, also known as Shin-chan in other countries) is a Japanese manga and anime series written by Yoshito Usui. It has 56 (including the New Crayon Shin-chan series) manga volumes. The anime has been broadcast since 1992, and there are twenty-four movies as of 2016. They are popular all over the world. The anime program Shinchan has more than 900 episodes. This show is broadcasteon Tv Asahi in Japan and on Hungama TV in India. Shinnosuke "Shin-chan" Nohara is a little boy who does everything he can to annoy his parents and teachers (and succeeds), but he only means the best. He just tries to have a good time and sometimes annoys people in the process. Shinnosuke Nohara: 5 years old boy. He lives in Kasukabe, Saitama in Japan and goes to Futaba kindergarten. He is also very fat and chubby. Hiroshi Nohara: Shinnosuke's father. He works for Futaba company. Misae Nohara: Shinnosuke's mother. She is a housekeeper. Himawari Nohara: Shinnosuke's sister. 0 years old. Theme Song: "SIX COLORS BOY"
There have been other specials in which feature-length movies were broadcast on television rather than in theaters. The special crossover episode Kamen Rider Den-O + Shin-O aired in 2007 to promote the Kamen Rider Den-O movie. A second special series was aired in April 2012 featuring Shin-chan and Kamen Rider Fourze to not only promote Crayon Shin-chan: The Storm Called! : Me and the Space Princess, but also Kamen Rider × Super Sentai: Super Hero Taisen. ↑ "Shin Chan". Funimation. Archived from the original on July 22, 2018. Retrieved July 22, 2018. ↑ "LUK Internacional - Catalogue, SHIN CHAN". www.lukinternacional.com. ↑ "RTE Guide - TV Schedules". 27 March 2003. Archived from the original on 2003-03-27. Retrieved 2018-12-10.